natalie_nd Great communication, good quality and she had to go to work but still met up with me for pick up. Thank you so much such a kind and lovely young lady. This super super SUPER soft Flare Cuff Jumper are GOALS for this Winter! Size XS This pre-loved has only been worn 3 times. Chic turtleneck jumper with side splits PERFECT for the cold weather. This jumper is quite thick and wind-resistant making it extremely comfortable for outdoors or indoors! Size S Pre-loved worn twice only! Worn 3 times during this Winter. This duffle coat is a staple in your wardrobe closet! Size 6 Coat is also fully lined with quilted inner and a fully removable oversized hood with short faux fur lining and faux fur hood roll. Chic dusty pink blazer with pockets from ZARA. Size 8 This pre-loved was only worn once. Still in an excellent condition! nearly BRAND NEW 'Grace Faux Fur Gilet' cream coloured. Only worn ONCE! - still in an excellent condition! Size 6 - those that are a size 8 would definitely be able to fit this as well. This is perfect for the cold breezy days of Winter. The gilet is very thick and extremely soft and furry. Fluffy warm White Knit (fits a size XS and S) High waisted shorts are avaliable for an extra $10.00. Black Bodycon Dress(3/4 sleeves) fits size XS and S.
Brand New Old Skoolz in blossom pink. 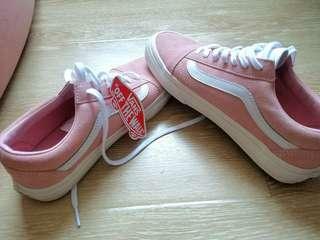 US women 6.5 Extremely cute colour, sold out in many stores already. Letting it go because the size is too small for me. Please only DM if you're a serious buyer. 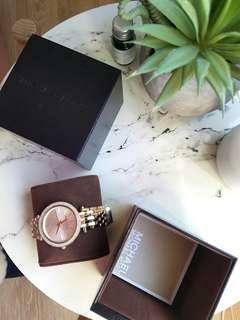 Authentic Michael Kors Darci Watch, still in a very good condition. Comes with tags and original packaging for verification. Please only DM for serious buyers. Pre-loved Camel Coat that is perfect for the winter/spring ! only previously worn once - Size XS. Can also fit a S as well. message me for more details if interested. 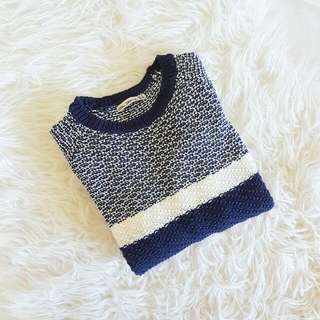 White cable knit with detailed cutting ; very warm, cozy and suitable for the cold weather. Can be layered or worn by itself. Can fit a size S and M. Only worn twice and is in a great condition.